Welcome to The Hub's central location for applause and accolades for all employees. It's nice to be recognized, and what better way to give a shout out than on our company's blog? Check out this all-star lineup of the movers and shakers at Arrowhead, Bellingham, OnPoint, ACM and its companies. In her previous role as ACM’s controller and a director of finance & operations for National Programs, Irina oversaw the finances and account of numerous profit centers. She remains involved with ACM on a limited supervisory/project basis. Jennifer Calderon has assumed Irina’s previous role and has been named as Services Division CFO. She has extensive accounting/finance experience with both Services and Public Entity Programs Profit Centers. 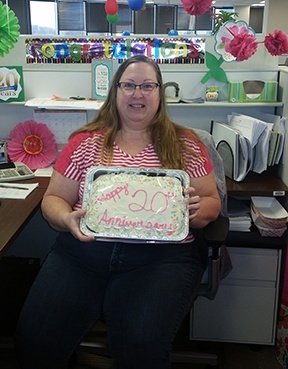 Beth Webb, underwriting assistant III, celebrated her 20th anniversary with the Automotive Aftermarket group in April. She joined Zurich in 1997 and was part of the Zurich group that transitioned when Arrowhead took over the division from Zurich in 2012. In 2015, she was promoted to underwriting assistant III. Beth provides technical rating and policy issuance support to the underwriting team, conducts quality checks on team members’ work and participates in new program rollouts. Congratulations for achieving this milestone, Beth! Deborah Clark was promoted to Aftermarket underwriting assistant III, where she is busy providing technical rating and policy issuance support to the underwriting team, participating in new program rollouts, conducting quality checks and assisting with the training and mentoring of new underwriting assistants. Deborah joined the Aftermarket group 2013 as an underwriting assistant I. “Deborah has been instrumental in building the training tools and processes for the new platform and is a huge asset to her team,” said Kristie Lyons, HR generalist in Overland Park. Congratulations, Beth, and we look forward to your next 20! Kimberly Porras and Yolanda Williams have both been named underwriting assistant II for Automotive Aftermarket. They both joined the team in August 2015 as underwriting assistants I. “Kimberly and Yolanda will continue to advance their knowledge by bringing additional strength to their teams,” Kristie said. Shannon Chaffee recently received her CPCU designation, said Steve Smith, vice president, personal property in Carlsbad. Shannon’s an associate product manager – property and has been at Arrowhead for 2 years. Said Steve, “I am very proud of how Shannon showed commitment to herself and her career by obtaining the designation. Her hard work and focus helped her complete the 8-course program with very high marks and in a short period of time. Shannon’s current position requires her to have a foundational understanding of all the facets of our business, so the knowledge she has gained from this program will serve her well in her current position and beyond for many years to come." Kudos on your achievement, Shannon! Lori Millslagle joined the team as graphic designer with eight years of experience as creative director for a DC-based app developer and also freelancing for various ad agencies. Her specialty is infographic design and animation. On the same day, Brianna Steiner also joined as administrative assistant, after five years at a San Diego law firm. "Both bring outstanding skills to our group: Lori is a topnotch designer and Bri is a whiz at learning the various marketing platforms that we use," said Duane Williams, AVP of Marketing Communications. "We’re excited to have them both!" Brian Jackson joined Marketing Solutions in May from ACM in Carlsbad, where he was working in a seasonal position with the Vail team. He is a new business development manager. Glad to have you here, Brian! Marquee Managed Care has two new employees: Louise Epperson, bill review manager, who started early April and Rita Gomez, MPN coordinator, who began in early May. We’re glad you’re onboard, ladies! Shawn West joined Marquee just a week ago as director of medical management. Susan McFarland, Marquee's nursing manager who has been with the company since July 2008 has retired, and Shawn is assuming her role. 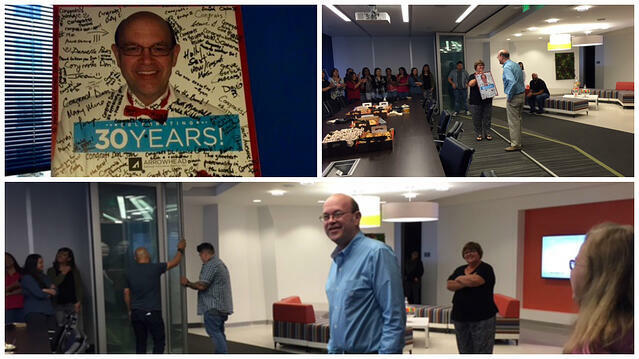 Susan, enjoy your retirement; Shawn, welcome to the team! Brad Hamby joined Bellingham Underwriters earlier this year as an underwriting account manager. Welcome, Brad! Melissa Claypool has been promoted to VP of operations from operations manager at OnPoint/ Arrowhead in Denver. And John Sodia was promoted in March to VP of underwriting for Arrowhead Tribal, from underwriting manager. John also just celebrated his fourth year at Arrowhead/OnPoint. Jennifer Holler joined ACM in January as a property adjuster and quickly distinguished herself, resulting in a promotion to senior property adjuster in May. She has 10 years of prior claim experience with Travelers, Hartford and Allstate. Jennifer worked field property claims in Buffalo, NY, San Diego, CA and catastrophe duty all around the country. Originally from Buffalo, Jennifer works in the downtown San Diego office. Teresa Heller joined ACM in January as property claims manager, with 33 years of insurance industry experience. Teresa’s career began in 1984 with Allstate. She served as SVP of claims and operations for Bankers Insurance, COO for an independent adjusting company and SVP of claims for American Integrity. Teresa also holds an Associate in Claims (AIC) and the Chartered Property Casualty Underwriters (CPCU) designations. Robert Carter joined ACM in February as a senior property adjuster. He formerly worked for QBE as a senior claims specialist, handling catastrophe property, farm and commercial claims and also ran an independent adjusting franchise in Northern California. Robert works remotely for ACM out of McAllen, Texas. Brian Miller has joined ACM as a tribal adjuster. His diverse, multi-line, multi-jurisdictional background includes more than 14 years as both a commercial and personal lines adjuster. He also spent more than a decade as a safety manager in a retail environment, concentrating on workplace safety, claims budget management, investigating employee accidents and misappropriation, product liability and general liability claims. Savannah Loftis joined ACM’s Extra Space team in February. She’s experienced in commercial claims adjusting and has been a great fit with the program, said Maureen Seifert, VP of Claims for Tribal. Tiffany Vasquez was recently promoted to ACM’s newly created MI PIP CA position (that’s Michigan Personal Injury Protection for Commercial Auto, for us auto insurance neophytes). She will be working with the MI PIP team in our Carlsbad office. Robert McCollor joined ACM Carlsbad in May as an auto Fast Track adjuster. He previously held a similar position at GEICO. Susan O’Neill started with ACM as a temporary auto adjuster in our Alpharetta, GA office and was retained as a permanent employee in May of this year. She was most recently with Tri-Star Risk Management and brought with her a wealth of claims knowledge and experience. Carrie Richardson was recently named an AVP at NCC. With more than 25 years of industry experience, Carrie’s background includes all lines as an insurance agent, advocate, trainer, property adjuster, plus leadership and vendor oversight. She has experience in all aspects of field service work from appraisal services to full adjusting including complex claims. “Carrie’s focus is developing and maintaining strong relationships by providing excellent customer service,” said Michael Hearn, NCC’s COO. Welcome to the ACM and Arrowhead team, all! We’re glad to have you! Heads up to six superstars from our Denver office. Maureen Seifert wrote, "I was fortunate to have Abbie Springer and Dawn Sullivan during a difficult time for the Extra Space Program. We were down several team members and they were at the front line handling the job of 5 people! I appreciate their dedication and hard work. They both did and continue to do a fantastic job. My sincere thanks goes out to both of them. I would like to recognize Lorna Birdow, Mark Gaarder, Paige Larson and Eddie Barreto for pitching in to help as well." Courtney Stubbs was promoted to Underwriting Assistant I in October. In her new role, she will provide technical rating and policy issuance support to the Aftermarket Underwriting Team. Courtney started with Arrowhead in May 2015 as a processing technician. While new to the insurance world, she caught on quickly to the job and became a valuable member of the processing tech team. Courtney then became the point person for the processing tech team, helping to train them on the new platforms and processes. She was also the go-to person for special projects, assisting the operations and underwriting teams. We are very glad to have Courtney join the underwriting assistant team! Cheryl Jones has been promoted to lead underwriter of the new Security and Alarm Program. Cheryl was instrumental in creating this new program with her hard work ethic and long hours. Her existing relationships also helped her land the majority of the new business customers. Way to go, Cheryl! She has been working with the OnPoint team in various sales and underwriting roles for over 10 years and has attended countless conferences in the security and alarm industry, even teaching continuing education courses to security alarm dealers regarding insurance basics and contracts. Many of her clients have stayed with her for the entire time despite the security program changing carriers periodically. The best quality about Cheryl is her pervasive upbeat attitude which is appreciated by the entire Denver team. Thank you, Cheryl! In August 2016, Jessica Coffey was promoted to senior commercial lines customer service representative for our Automotive Aftermarket Program in the Overland Park, KS office. She started with Arrowhead back in March 2015 and caught on quickly to the CSR role. She was a great help to our customers and account executives in her first year; now in her new role, Jessica will focus on working with the Aftermarket's strategic accounts. We couldn't be happier to see someone so talented rise in ranks so quickly. Keep up the great work, Jessica! We're rootin' for you. Scott McKechnie, Justin Shaw and Kim Wooten have been promoted to Underwriter I for the Automotive Aftermarket Program in Overland Park, KS. In their new roles, these three individuals will have expanded underwriting responsibilities within an assigned territory. They will be responsible for retaining current customers, working directly with producers to drive new business growth, and identifying trends and opportunities to improve the results of the book of business. Scott joined Aftermarket in March 2015 and Justin came on board in April 2015. Kim is a long-timer, hired in June 2001 at Zurich Aftermarket and then transitioned over when the Automotive Aftermarket Program became a part of Arrowhead in October 2012. Congratulations, you three, on your success, and keep on writin’! It is a great honor to thank those who have been with Arrowhead from the early days of our company's start. Today we celebrate Don Lehmer from our Facilities team. Don, you truly helped create the foundation of Arrowhead's strong family-like culture, and for that we thank you. Lindsey Whitney was promoted to processing team lead this past May, and we couldn't be happier for her. Lindsey started with the Automotive Aftermarket Program in March 2013 as an underwriting assistant I and was then promoted to underwriting assistant II in July 2015. In her new role, Lindsey will assist the operations manager with monitoring workloads and production for the processing team and will be available to answer day-to-day questions on the new Express system. She will also assist in training the team on the system. Lindsey has been a great asset to the processing department, and we look forward to her contributions as the team lead. Way to go, Lindsey! Congratulations, Erika, on your promotion! Rachel Green has been promoted to casualty supervisor of the ACM’s Property team. She will be overseeing a unit handling third-party homeowners claims and will also counsel for the more complex litigation files. Rachel will report to Tim Allen, VP of ACM Property, in the ACM Tampa office. Rachel has been with ACM just under a year, initially working as a property examiner, where she handled a variety of claims such as fire, hail, freezing and windstorm. Before joining the ACM team, Rachel spent 10 years practicing law in Florida. In that time, she litigated insurance defense cases, property claims, contract and business litigation, real estate law, as well as some bankruptcy and family law. When Rachel isn't buried in claims files, she's off running with her dogs (or any activities with them), cooking and gardening. Carolyn Pallasigue has been promoted from underwriting support associate to underwriting support lead in Arrowhead's Workers’ Compensation department. She will be overseeing reports, to ensure accounts are both accurate and are being processed in a timely manner, for new and renewal business.No newcomer to Arrowhead, Carolyn passed her 18-year mark with us back in the fall. Known as a go-getter and hard worker, she’s an invaluable resource of industry information for her coworkers. When not crunching numbers and analyzing reports, Carolyn loves to travel. She's been to Europe (France, Italy, England, Switzerland, Monaco, Austria and Luxembourg) and Asia (China, Japan, Hong Kong, Singapore, Japan and Malaysia). She also loves sampling gourmet food around the world. The strangest foods she's tried are fried worm in a barbecue stick and frog stew, both in Malaysia. Carolyn, we're adding bravery to your kudos list as well.Currently Carolyn's enjoying a vacation in the Philippines before she takes on new responsibilities, so send her a quick email around Feb. 11 to congratulate her both on her promotion and on 18 years of service. A number of your coworkers attended the Brown & Brown annual sales meeting in Nashville the first weekend of March 2016. A new category of awards was added this year called The Profit Center MVP. It was introduced to recognize individuals who have had the greatest impact in the overall performance of their teams. This year we have eight winners out of a pool of 55 profit centers. The criteria for winning is set within each region and profit center and is not simply a case of being the top performing teammate in the office. To win this award means that this individual has raised the bar within their office and had a material impact on the financial performance of the profit center. The meeting next year will be held in Las Vegas. If you are interested in learning more about how you can attend or be a contender for an award, contact Steve Boyd, President National Programs. Monica Loveall has been promoted from Team Lead to Program Manager - Specialty Wholesale. The Specialty Wholesale Program is made up of Tire Wholesale, Tire Retread and Parts Wholesale Operations.No newcomer to the Aftermarket scene, Monica joined the Zurich Aftermarket team in June 2001 and moved with the Zurich team to Arrowhead in October 2012. She has been an invaluable resource to many of our underwriters and has helped mentor and train many of the new underwriters that we have hired in the past few years.No doubt Monica has plenty of stories she could share, along with lots of shortcuts and best practices - that's why we're so fortunate to have her.Congratulations, Monica! High five for one of our Automotive Aftermarket team members on her recent promotion. She is a long-time Aftermarket employee. Teri Allen was recently promoted to Operations Manager. She will oversee our Processing Department which includes our Underwriting Assistants and Processing Technicians. Teri is fast coming up on her 15-year anniversary (gee, Teri, did you start with us at age 15?). She joined Aftermarket on Oct. 30, 2000, so be sure to give Teri double congrats - for her promotion AND her 15 years. Well done, Teri!